Casemachine, LLC has come up with a silicone-aluminum hybrid which will give premium fall protection to the iPhone. 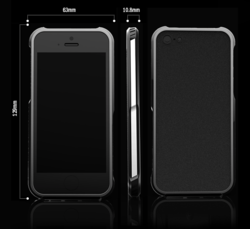 Casemachine aims to reduce the bulkiness of a normal iPhone case and give a case-less feel thru its latest addition of the new Casemachine i5 Slimline (v2) for Apple iPhone 5. The case for those who don't like cases! On the v2 for the Slimline, the company has replaced thermoplastic polyurethane (TPU) with soft touch silicone. The silicone gives a more detailed look and caters for an elegant profile of the new Casemachine i5 Slimline (v2) for Apple iPhone 5. Along with CNC machined aluminum and Alcantara Suede backplate, the company’s latest development is claimed to provide an elevated user experience. The Casemachine i5 Slimline (v2) for Apple iPhone 5 has reinforced corners to hold the phone firmly in place. The carbon fiber backplate is also replaced with branded suede which is even lighter and promises no influence on signal reception and/or data transfer. Casemachine states that the v2 will give an even tighter grab than the original i5 Slimline Flex Case and that the soft touch silicone gives a premium feel to the touch. The silicone is soft but still promises a tighter overall grab, making the new Casemachine i5 Slimline (v2) fully stick to the phone’s body. Unlike its predecessor, Casemachine has only left open windows on the bottom for docking and headphone connectivity. The original i5 Slimline Flex case did not cover the bottom panel of the iPhone 5. The new Casemachine i5 Slimline (v2) for Apple iPhone 5 will also have a slip on nature, which does not require any screws to stay in place. Attention is laid to the rear panel, and for a more customized look, Casemachine has redesigned the optional dimensional backplate for the new Slimline. The optional backplate can be purchased thru the Casemachine online store and is available in eight different shades. On the top is a redesigned soft touch sleep/awake logo button which will add further style while providing protection to the phone’s original power button. An integrated volume switch is designed for the Apple iPhone 5 which provides a sleek profile to the sides. Apart from that, Casemachine has used CNC machined, aircraft grade billet aluminum inlays, thus adding a compelling brushed look on the sideline. Casemachine was also present at the Las Vegas CTIA Show which was conducted from May 21, 2013 – May 24, 2013. The company also presented the new Casemachine Slimline (v2) for Apple iPhone 5 to the attendees where it received a warm welcome. The new Slimline will be shipped to all parts of the world starting May 27. The All New i5 Slimline V2 for Apple iPhone 5The case designed for those who don't like cases. The All New i5 Slimline V2 for Apple iPhone 5The case designed for those who don't like cases.